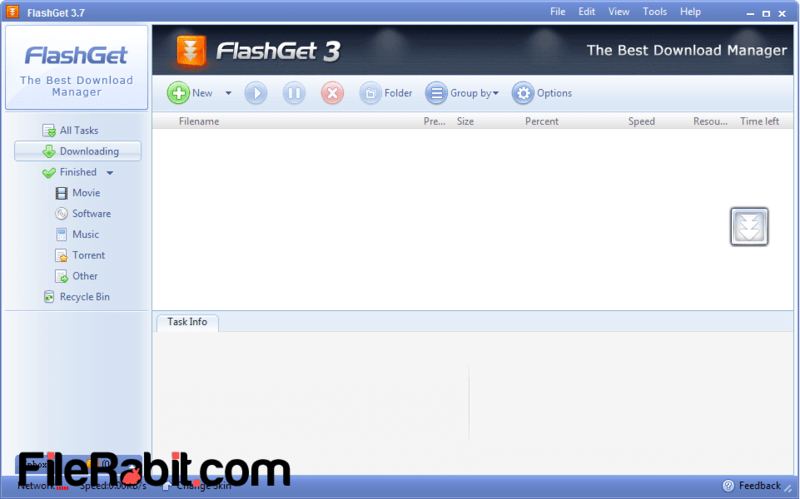 FlashGet is fast and best file manager used to download programs, videos, music, torrent, documents and thousands of other files with super fast transfer speed. Every computer user needs an extra professional tool that will grab targeted videos, music, programs, documents and compressed archives from the server with single click. A fast network connection including fast download manager is choice of every computer user. The race among different file managers is never finished, all of them are trying to reach at the top but the decision is still in the hands of users. FlashGet has simple interface with dozens of customizable skins. FTP and HTTP servers support is available but unfortunately, HTTPS server support is not available until now. However, preferences are just customizable with switching directories, change output file name, file destination and many more. It will start the downloading dialog box when the clipboard has some supported download file link. Moreover, it has support to handle .torrent files so no worries about slower downloading in Chrome, Firefox, Safari, Opera and internet explorer’s default downloading managers. Add downloads manually or it will response supported files by automatically. The engine will be integrated into supported internet browsers so whenever a file will be downloaded, flash get will open it by default. Furthermore, resume, pause and stop downloads with 1 click or handle multiple files at once easily. MHT technology will boost transfer speed up to 10x faster with splitting files into pieces. As security and privacy protection, FlashGet will call available antivirus to scan downloaded file for viruses, malware and spyware based threats. The software is simple and easy to install without having 3rd party applications or bunch of advertisements. It will also using lowest system resources (RAM and processor usage) and do not hang system during running in the system background.